For some, Christmas in Taiwan might not feel quiet like the time of year they grew up knowing. For one thing, Christmas is not recognized as a holiday on the island. If Christmas falls during the week it's a regular work day for everyone. The Perfume River divides the North and South sections of Hue. In the north, the Citadel, a walled fortress and the remains of The Forbidden Purple City, home to the Nguyen emperors. The South contains modern Hue, much of which had to be rebuilt after the Vietnam War. On my recent trip to The Philippines I flew from Taipei,Taiwan direct to Cebu City, the second largest urban center in the country next to Manila with a population of approximately 1 million. The total surrounding metro Cebu City population is around 3 million. I was checking out Pham Ngu Lao and Bo Vien known as the backpacker center. I normally like exploring and photographing less touristy areas of a city but it never hurts to be familiar with places where you’re more likely to meet up with fellow travelers and exchange stories, suggestions and tips. Kagbeni is one of the most interesting villages in all of Nepal with it’s ancient Bonn Animist beliefs, statues and a picturesque location in the Kala Gandaki gorge. We arrived at Thorung Phedi just before dark. An 8 hour day with an elevation gain of over 1000 meters. Long, tiring, and risky before a summit of the Thorung La Pass. But I was fine other then feeling the long day on the trail. There are two routes to Manang from Pisang. A lower trail that’s a little easier with less climbing and the upper route, slightly more challenging but also helpful for acclimating with bonus mountain views. We chose the route north of the Marsyangdi and headed for Upper Pisang. It’s a shame that many drive through this part of the circuit for upper Annapurna trekking and stays missing the epic river and waterfall views in this portion of the trail. The suspension bridge crossings that put you right in the middle of the energy path of the mighty Marshyangdi are breathtaking. The Annapurna Circuit Trek is one of the greatest hikes in the world with amazing views of the Himalaya’s Annapurna Massif, the opportunity to trek in two different river valleys of Nepal, the Marshyangdi and Kali Gandaki. Da Lat is located in the South Central Highlands of Vietnam. It was established by the French during their occupation as a hill town resort in 1907. I was truly looking forward to live streaming much of my recent trek of the Annapurna Circuit in Nepal. This of course is one of the most popular hiking trails in the world with stunning views of the Annapurna range of the Himalaya. I’ve have been very fortunate to have trekked some of the greatest trails in the world. Everest Base Camp in Nepal and Tibet, the once forbidden Upper Mustang region of Nepal, and India’s Singalila Ridge trek among others. I always get asked when is the best time to visit Taiwan. I always respond with almost anytime if you don't mind hot weather, rain, or an occasional typhoon. In this episode of The Best Of Far East Adventure Travel "Live" highlights from two great spots to visit in Southern Vietnam. The hill station town of Dalat and Vietnam's largest beach resort, Nha Trang. Two completely different experiences both filled with adventure activities and beautiful scenery. Ho Chi Minh City, Vietnam is a rapidly changing urban landscape. On my recent visit I was surprised to still find some iconic sites left over from the Vietnam war days despite all of the new construction including a underground metro system. One of the loveliest times to explore and wander the atmospheric streets of Hoi An, Vietnam is the early morning hours. Ho Chi Minh City, Vietnam, or Saigon a name still used by many of it’s residents is full of history, culture, amazing nightlife, and a city that’s modernizing rapidly. On my most recent visit the skyline was noticeably filled with cranes atop new buildings and an underground subway under construction. Chiang Rai, Thailand is one of the those places you end up staying longer than planned. Even though it's the largest city in the most northern part of the country there is a wonderful "chill vibe", evident in the slow place, the numerous cafes, wonderful Buddhist temples, including the original home of the Emerald Buddha. Bangkok, Thailand is full of history, exciting street life, notorious red-light districts, fantastic food and enough stimulation to call it one of the most exciting cities to visit on the planet! It’s actually the second most visited city in the world following by London as the top spot and preceding Paris in third place. Kerala is one of my favourite states to travel through in India. It has an interesting history filled with some of the most varied culture and religion in all of the country. Mumbai, India is one of the most exciting destinations in South Asia. Easily the richest city in the region, the most expensive private home in the world is located there, it’s a roller coaster ride of experiences from visiting neighbourhoods filled with British “Raj” architecture, holy sites, crazy markets, and yes even long stretches of beaches, just don’t go in for a swim. OK, I don’t want to mislead you, this is not the busiest street in Chiang Rai and there is lots of traffic in the city but it’s easy to feel like it’s not busy in this town and surrounding area with a population of around 200,000. It’s one of the most coveted treks in the world. Everest Base Camp, Nepal. Far East Adventure Travel is proud to present two podcasts completely devoted to the magic of trekking this region. From crossing the sometimes treacherous Chola Pass to the final steps arriving at Everest Base Camp. And an early morning ascent of Kala Patthar for one of the best views of Everest in all of Nepal. Adam’s Peak or Sri Pada is located in Central Sri Lanka and is a 2200 meter conical shaped mountain. All religious faiths on the island consider a hike to the top the holiest pilgrimage. Most will make their ascent in the early in the morning to reach the peak for sunrise. Wat Rong Khun or "The White Temple" is a popular tourist attraction located south of Chiang Rai in Chaing Rai Province, Thailand. The Pingxi Sky Lantern Festival is one of the most popular Lunar New Year Celebrations in Taiwan. People will travel from all over the island just for this event which starts about two weeks before the end of Lunar New Year festivities. Tibet changed my life. I have never looked at the world the same since. If you want to touch the deepest part of your soul, visit this land. The roots of spirituality are here. The sites and landscape are breathtaking. Laos is a country that is very appealing to me. It’s in the heart of Asia but for some reason has remained a low tourist traffic area on the South East Asia circuit. Whether it’s backpackers or luxury travellers, the big numbers are not there yet. It’s surprising because it has amenities and activities to fit both group’s needs as well as amazing travel value! Sankhu, is a historic town that sits on the old Tibetan salt trade route in the Kathmandu Valley, 17kmh away from the capital of Kathmandu. For Nepal 2015 will go down as one of the worst years on record, for disasters, politics, everything! On April 25 at 11:56am an earthquake with a magnitude of 7.8 shook the country from it’s epicenter at Lamjung District at Barpak, Gorkha. Beitou District is a short 20 minute MRT ride from Taipei, Taiwan but it feels like your in another world. Serene compared to the bustle of Taipei, the hot springs resort area of the district is situated right over the Tatun Volcano Group, making it a prime location for hot springs. The Grand Palace is the busiest tourist attraction in Bangkok. It has been home to the Kings of Siam and Thailand since 1782. It is not one building as the name implies but a series of buildings, halls, and pavilions set around courtyards, open lawns, and gardens. In Northern Thailand 15km away from the border of Myanmar lies Santikhiri, otherwise known as Mae Salong. It’s history was in part formed by the opium trade as part of the Golden Triangle. More recently it was settled by members of the 93rd division of the Chinese Nationalist Army who refused to surrender to communist China when they were defeated by Mao’s army in 1949. Plan your trip to Chiang Mai, Thailand to fall on a weekend and you'll be rewarded with the opportunity to visit it's two major night markets or walking street markets. No discussion on the food of Taiwan would be complete without a visit to Taipei’s Shilin Night Market. This is one of the largest night markets on the island with streets that wind around a section of the city filled with food stalls, restaurants, clothing and souvenir shops, and amusement games. The Lantern Festival marks the 15th day of the Lunar New Year and traditionally ends festivities. In Taiwan it's just the start of a spectacular display of creativity with paper, lights and even more high- tech tools used to dazzle the large crowds that turn out across the island for the festivals. We get the signal, they're ready to go. The men at the front of the palanquins quickly turn their backs to the wall, and brace for the barrage of piercing rockets. And the cacophony of the beehive began with roaring tides of bottle rocket streaks fired off in all directions. Exploding in mid air, sometimes right in front of my mask and tiny explosions at my feet. Phnom Penh has been the capital of Cambodia since French colonization. It is the country’s largest city with a population of over 2 million. It’s the center of commerce, the arts, cultural heritage and diplomacy. Once called “the pearl of Asia” it was one of the most beautiful French built cities in Southeast Asia. 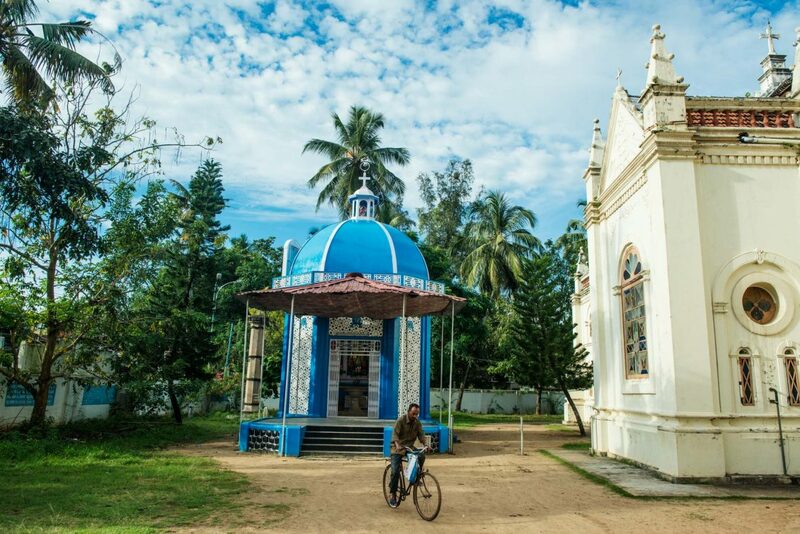 With the diverse mix of beliefs, spirituality and cultures Cochin is also known as a very tolerant community with harmony like nowhere else in India. When asked when's the best time to visit Taiwan I usually say almost anytime but festivals, especially Lunar New Year celebrations are when the island's culture and spirit are at it's peak. Pokhara is the second largest city in Nepal. Situated on Phewa Lake it’s close proximity to the Annapurna range of the Himalaya makes it a trekking center for the world-famous Annapurna Circuit. Kagbeni is one of the most interesting villages in all of Nepal with it’s take on Western shopping and food culture. But it’s much more than that. Ancient Bonn Animist beliefs, statues and a picturesque location in the Kala Gandaki, the world’s deepest gorge. Join me John Saboe for a special edition of Far East Adventure Travel Podcast on the Buddhist trail to the Upper Mustang-The Medieval village of Kagbeni, Nepal. The Batu Caves are a series of limestone caves and cave temples located in Selangor, Malaysia. So easy to get to it even has it’s own train stop.